I feel like a bloated elephant right now. Something about the clothes I'm wearing, the Braxton-Hicks contractions which are squeezing me like a famished boa constrictor and (possibly) the fact that I just ate a gigantic oatmeal raisin cookie with a huge glass of milk chaser. I'm also getting bored -- OH SO VERY BORED -- of the same belly shot angles and locations week after week. But unless I want to train Teyla to take my picture outside -- which I'm sure she believes she could do anyway -- this will have to do, for today. Here I am, at 28 weeks. Please note the fact that I put on MUCH CUTER clothes for my portrait today. But at lunch -- in which I took all three kids out to IHOP by myself after church, which makes me either gutsy or stupid, take your pick -- Teyla peed all over me. (I honestly have no idea how she did that. Her diaper wasn't leaking. Somehow, she managed to twist in such a way as she sat balanced on my lap that she, ahem, relieved herself directly through her leggings and onto my jeans and shirt.) As you might imagine, I ditched the urine-soaked clothes as soon as I got home and I pieced together the gem of an outfit you see above. Also, do you love that you can see my stretched out belly button through all my shirts now? Pregnancy is the weirdest thing ever. If you or someone you know is also great with child, be sure to check out the baby shower being thrown in honor of Beth of I Should Be Folding Laundry -- only in this case, the guests get a gift every time Beth does. The shower giveaways run all week at Adventures in Babywearing. AWESOME! Loving that bellybutton. And your facial expression is pretty telling, too. ;) I hope you have a fabulous 29th week, Kelly. You are adorable and I love you! that's awesome. The peeing especially. Wish I could hug you now! And rub that belly. I do so love it when OTHER people are pregnant! you look beautiful!!! i totally agree about the belly button thing. mine looks like a large cereal bowl now after 4 pregnancies! Enjoy! I know it gets tiring, but I can hardly remember what it's like being pregnant. It's such a miraculous and special time in a mom's life! Although I do remember being happy when I got on the other side of 30 and reached single digits of weeks late! I'm with you on the boring photos, though. Side shot? Check. Belly shot with tape measure? Check. Blah blah blah. You still look gorgeous. Just one more trimester to go! Isn't it weird how everyone else's pregnancy seems to progress so much faster than your own? I can't believe you're already 28 weeks. Look at that BELLY! Oh you are darling. Also- thank you so much for mentioning the shower! You are the cutest! I was so huge my fourth time around but I totally wish I'd done more documentation. You may think me crazy, but I miss the whole pregnancy deal! Really! Not enough to go back, mind you--having two teenagers is its own form of restraint... Ha! Shudder.. Being peed on is THE worst. If that happened to me I'd be in trouble because I have a small shortage of pants that fit. Why yes, I am still stubbornly thinking that I'm going to fit back into my pre-maternity pants ANY day now. Ugh. That feeling of pee on your leg is awful. It doesn't matter if it's someone else's or your own. Not that I'd know about the latter (yeah right). That itchy, burny feeling... hang on, I need to go take a quick shower. Okay. I'm back. You are SO CUTE when you're pregnant, Kelly! So cute. I love the cute little smile on your face in the pic. 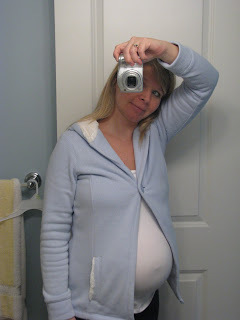 And I have a confession - I'm 18 1/2 weeks along and don't have a single belly picture yet. BUT! One is coming this week to feature on my blog and YOU have something to do with it. Is the suspense killing you?? ?